An impressive three bedroom detached villa situated in a private residential cul-de-sac only 3 miles from Dumfries town centre. The property benefits from Oil fired underfloor heating, Solid Oak finishings throughout, a surround sound system throughout the house, and is fully double glazed with integral garage and private garden. Accommodation comprises: - Lower Floor - Entrance Vestibule. Hall. Toilet. Lounge. Kitchen/Dining Room. Utility Room. Master Bedroom with En-suite. Upper Floor - 2 Bedrooms. Bathroom. Garage. Glazed UPVC entrance door with glazed sidescreen and south facing window. Tiled floor. Archway to hall. Understairs storage cupboard. Laminate floor. South facing frosted glass window. white wash hand basin and WC. Tiled floor. South facing window overlooking front garden. Feature fireplace. Oak hardwood flooring. North facing window overlooking rear garden. Modern kitchen with a range of floor and wall units with inset 1½ bowl composite sink and drainer, ample work surfaces and breakfast bar. Integral fridge, freezer, dishwasher, electric oven and hob. West facing double French doors opening out onto rear garden. Door to rear garden and north facing window. Range of floor and wall units with ample work surfaces and inset stainless steel sink and drainer. Space and plumbing for washing machine and tumble drier. Tiled floor. South facing windows. Built-in storage cupboards. Separate dressing area with fitted wardrobes. North facing frosted glass window. Fully tiled shower area with mains power shower, wash hand basin and WC. South facing velux window. Built-in storage cupboard housing hot water tank. Laminate floor. Radiator. South facing window. Two built in storage cupboards. Laminate floor. Radiator. South facing window. built-in storage cupboard. Laminate floor. Radiator. North facing velux window. White four-piece bathroom suite comprising shower cubicle with mains shower, roll foot bath, wash hand basin and WC. Tiled floor. Radiator. Monoblock paving with off road parking for up to three cars leads to integral garage with up-and-over garage door. Light and power laid on. The garden to the front of the property is laid in lawn with planted borders containing a variety of shrubs and plants for all year round interest. The rear garden is fully enclosed by a wall giving privacy and shelter. There is a lawn and paved patio as well as trellises and planted boarders. Oil tank. Genuinely interested parties should note their interest with the Selling Agents in case a closing date for offers is fixed. However, the vendor reserves the right to sell the property without the setting of a closing date should an acceptable offer be received. Mains water and electricity. Oil fired underfloor heating. The property is connected to the mains drainage system. Strictly by appointment only. Please contact the Selling Agents on 01387 257300. 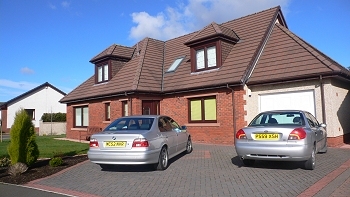 Offers in the region of £265,000.